The world of work can be a stressful place to spend time in and even the strongest of us have negative emotions that can hold us back from achieving everything we want to achieve in our careers. They can also cost companies and the economy a fortune, with the American Psychological Association putting the cost to the US economy of work-related stress at around $500 billion a year. There’s no way to stop the causes of these negative thoughts, but you can train yourself to respond to them in a positive way. Psychologists call it emotional agility and improving yours can stop you from seeing every setback at work as a personal defeat that leaves you struggling to bounce back. One key step is to identify these negative thoughts when they arrive, which will help you be better prepared to challenge them and move on. The best way to move forwards is to focus on what you can do to improve the situation, rather than dwelling on the feelings of frustration and stress. If you are still feeling the effects of these negative emotions, there are ways to calm yourself down, even in the heat of a bad situation, like taking a breath and counting to ten or practising visualization techniques. 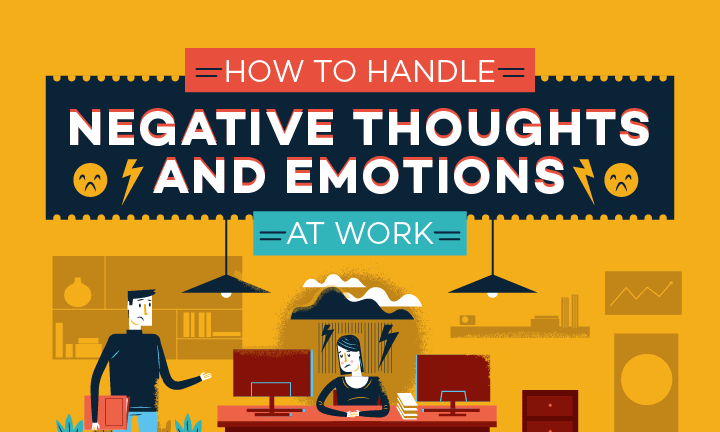 You can find out more about all of these tips for combating negative emotions in your working life in this infographic from QuickQuid, which also has more information on emotional agility and the types of negative thoughts that commonly affect us at work.